At Broto: Art, Science & Collaboration, we’re working on a framework to foster collaborations that are “substantive, real-time, credible and mutual.” While we might expect that artists and scientists going into such a partnership have a common level of mutual, professional respect, what might that mean if we drill into that sense of regard? 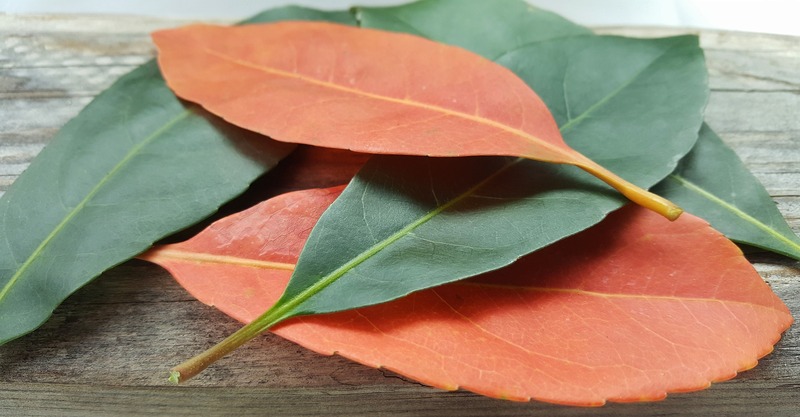 As it turns out, artists and scientists may be mismatched in key assumptions about each other including their focus on process – which may be a clear area to negotiate as they engage in a collaboration partnership. Additionally, scientists might have a somewhat better understanding of artists than the other way around. 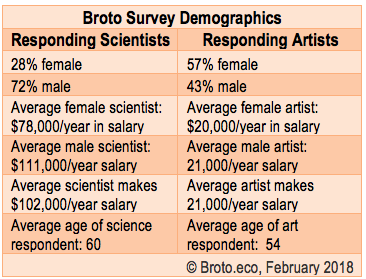 In February 2018, Broto, a new organization dedicated to art and science collaborations, distributed cloned, online surveys to 100 professional artists and, separately, 100 professional scientists in the US and Canada. As part of the cloned surveys, the professional artists and professional scientists were given the same 14 descriptors to assess both themselves as a group and the others as a group. What we can compare, then, is what scientists think generally about themselves and contrast that with what they think generally of artists – and vice versa. The goal of this part of the survey was to assess where artists and scientists might have common regard – and therefore more grounds for potential collaborative relationships. 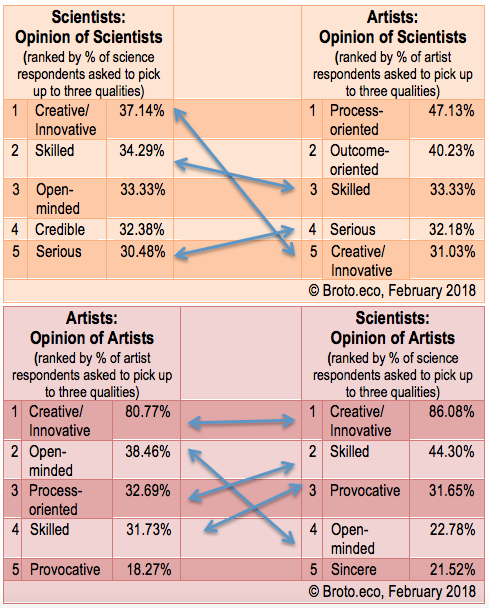 We compared the same data for this line of inquiry in two of ways: grouping the scientists’ and artists’ results together (as above) and grouping the professions results together (as below). For instance, in the survey results, there is good correlation between how artists evaluate themselves and how scientists evaluate artists. According to the results from this survey, both camps value creativity in their work – a potential bridge builder in assembling future collaborations scopes of work. Everyone thinks everyone is “skilled.” Top vote-getting adjectives like “sincere” and “open-minded” suggest mutual respect is possible. 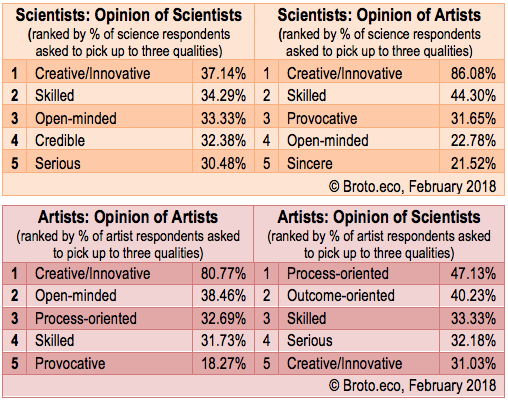 Both artists and scientists describe artists as “creative/innovative”, by wide margins, over other adjectives. Additionally, in each group, they each independently ranked artists as “skilled”, “open-minded” and “provocative”. How scientists regard themselves and how artists regard scientists is more mismatched, comparatively. In the top five most popular choices for scientists, “creative/innovative” ranked highest for scientists, and in the fifth best among artists’ opinions of scientists. “Skilled” and “serious” also made both top lists. However, artists regard scientists as “process-oriented” and “outcome-oriented” – their top two picks by significant margin – while neither of those adjectives were top vote getters for scientists evaluating themselves. The scientists opted for “open-minded” and “credible”. This finding is consistent with earlier investigative talks during Broto’s development phase in which artists, in particular, expressed the concern that collaborations were one sided when it come to outcomes. That pressure to produce results may be valid, but it must come from stakeholders other than scientists who, in this Broto study, don’t put priorities on outcomes. Perhaps, for artists in collaborations, this might come as relief. Notable, also, is the spread of percentages in the top lists for scientists – with more even splits among the descriptors for scientists than for artists. The results for artists are more absolute with greater alignment and agreement about the descriptors. Some of the differences to leverage or manage? Scientists get to be “serious”, while artists are “provocative”. Scientists don’t seem to value process or outcomes to the degree that artists do. In understanding how the two groups regard each other, it is perhaps helpful to get a snapshot of our respondents. Part of the survey tool included questions about demographics. The pool of respondents in both scientists and artists were predominantly US-based, with a minor representation from Canada. The same marketing tools, territories and outreach strategies were used in polling both populations. While the gender split in the scientist pool was 72% male, the majority of respondents in the artist pool were women. The financial disparity between the two groups is very evident with artists, on average, making only 1/5th the annual salary of the average responding scientist. The gender disparity was more distinct in scientists with the average female scientists reporting annual income that is about 30% less than their male counterparts. Men and women in art appear to make about the same incomes per year, on average, from their work.